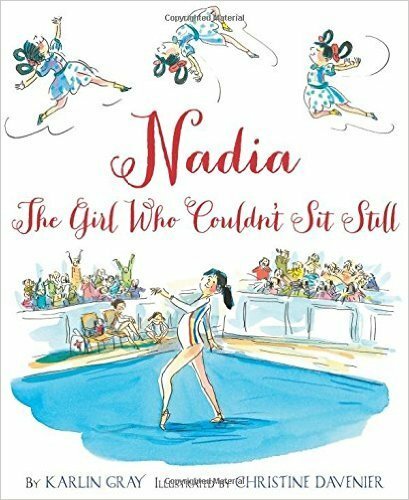 Nadia: The Girl Who Couldn’t Sit Still introduces us to Nadia Comaneci in the village of Oneşti, Romania, when Nadia is a young girl. 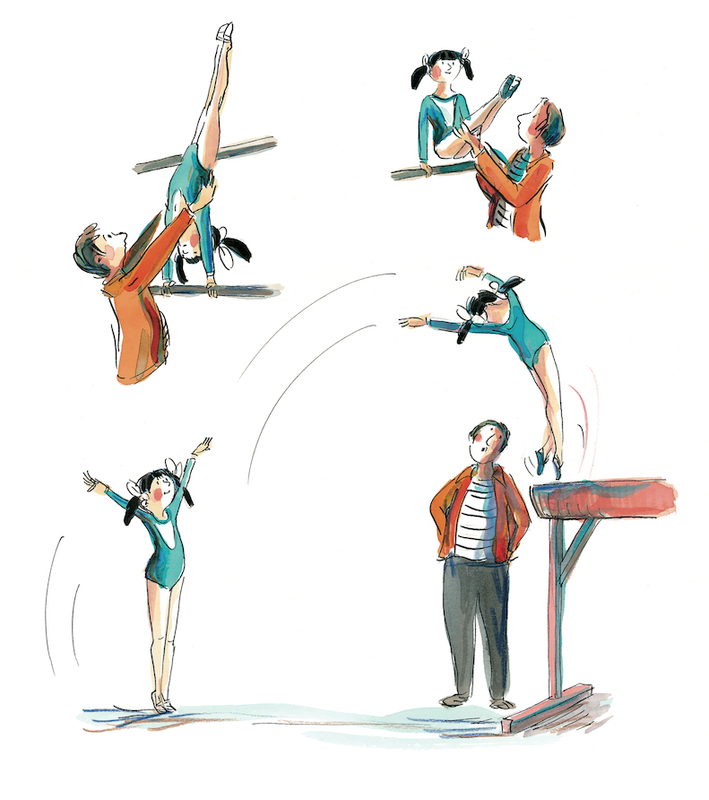 In the humorous, vibrant illustrations, the reader experiences Nadia’s love of climbing trees and her impatient and fearless attempts at roller skating and bicycle riding. When Nadia clambers up the family’s Christmas tree and sends it toppling over, Nadia’s parents sign her up for gymnastics lessons. Interior artwork from Nadia: The Girl Who Couldn’t Sit Still by Karlin Gray with illustrations by Christine Davenier, HMH ©2016. From there, Nadia is spotted one day at school by gymnastics coach, Bela Karolyi, and joins his new gymnastics school. Six-year-old Nadia diligently practices her moves until she masters them. We are shown her failures during early competitions but Nadia perseveres and makes the 1976 Romanian Olympic team. In this competition, though Nadia shines, the audience is astounded when her score reads only 1.00. We soon discover the scoreboard had not been programmed to display numbers above 9.99. Instead of a 1.00, Nadia had scored a perfect 10.00! She goes on to repeat her astounding score seven more times, winning five Olympic medals. When the 2016 Summer Olympics open, families will be following gymnastics teams and rooting for their favorites. Reading Nadia’s story is an inspirational and timely accompaniment. Read more about author Karlin Gray here. 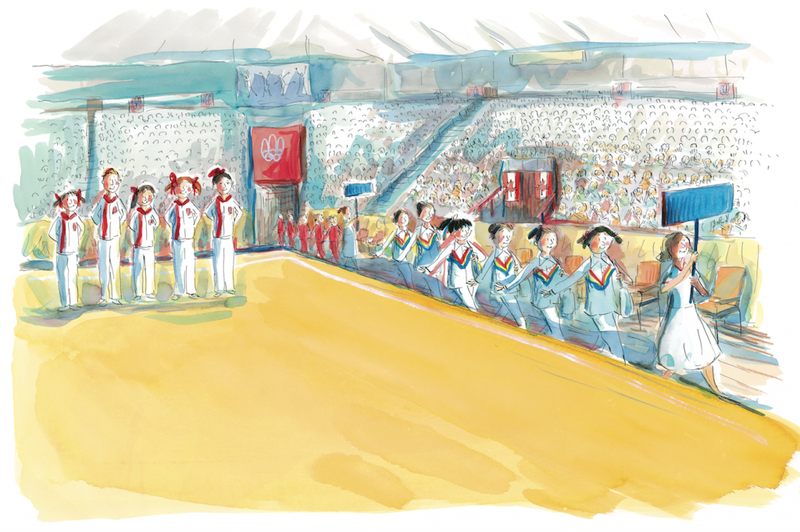 Read more about illustrator Christine Davenier here.